Phantom Fighter (霊幻道士 Reigen Dōshi?) is a video game released for the Nintendo Entertainment System in 1989 in Japan, and in April 1990 in the United States. The Japanese version is based on the 1985 film, Mr. Vampire (Reigen Dōshi being the Japanese title of the film). As a kung-fu master, the player must fight through eight towns filled with Kyonshi (each with a unique town boss). A small selection of items, and a large selection of fighting moves could be used on the enemy. The game also included a hidden character that made the game much more difficult, a baby kyonshi or "Conshi." 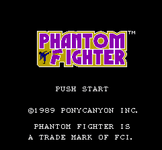 Source: Wikipedia, "Phantom Fighter", available under the CC-BY-SA License.